SALT LAKE CITY (AP) — A massive fireball soared into the sky in the central Utah desert after officials blew up 11 derailed tanker cars containing propane and biodiesel. BEATTY, Nev. (AP) — Environmentalists are taking over a faded Nevada mining town, but many locals don't seem to mind. HESPERIA, Calif. (AP) — Firefighters have rescued a very big cat — a mountain lion — from a tree outside a home in the Southern California desert. The homeowner called authorities Saturday after spotting the animal near the edge of the San Bernardino Mountains. San Bernardino County firefighters found the large mountain lion perched on a branch about 50 feet (15 meters) high. LAS VEGAS (AP) — Las Vegas is known as a dry desert town but the city's urban trees can be overlooked when competing for attention with the city's flash and neon. The U.S. Forest Service wants to inventory Las Vegas' urban forest, identifying it as one of 100 U.S. metropolitan areas to eventually add to its annual national tree tally. SANTA FE, N.M. (AP) — New Mexico's departing state land commissioner is warning against oil and natural gas drilling activities in a desert grasslands area where environmentalists have sought protections for decades. State Land Commissioner Aubrey Dunn on Thursday urged the state to ensure that fresh water supplies and wildlife in the Otero Mesa area are safeguarded from contamination by the oil and natural gas industries. PHOENIX (AP) — Arizona's Game and Fish Department says it is restoring about 60 bighorn sheep to two historic habitats in the state. PHOENIX (AP) — Arizona transportation worker Zach Moralez knew something wasn't right when he saw a damaged fence along a highway. Tracks went off the edge of the road and through the fence on the edge of the hill. Moralez, a highway operations technician, knew there had to be a car at the bottom. "We got down there as quick as we could, hollering out if anyone could hear us," Moralez told The Associated Press on Wednesday. "No response." ALMOG, West Bank (AP) — An Israeli farmer has cashed in by making exotic honey from a rare tree that produces frankincense — the resin once worth its weight in gold and venerated in the Bible. But the farm's location in a far-flung West Bank settlement has left a bitter taste in at least one investor's mouth. SACRAMENTO, Calif. (AP) — A last-minute effort to require more state oversight of a company's plan to pump water from underneath the Mojave Desert passed a key committee Tuesday, advancing in the final days of the legislative session. LOUISVILLE, Ky. (AP) — Another addax calf has been born at the Louisville Zoo. A zoo statement says the male Saharan addax -- also known as the white antelope or screwhorn antelope -- was born Aug. 19 and weighs 18 pounds. The endangered animal is found in the wild in arid regions of Africa, including the Sahara desert, where they typically live in small groups. TUCSON, Ariz. (AP) — Border Patrol authorities say 128 immigrants believed abandoned by smugglers in a remote desert area at the Arizona border with Mexico are facing deportation. Agents at the Ajo Station patrolling near a border fence say the group included children — some as young as 4 — from Guatemala, Honduras, El Salvador and Mexico. The immigrants were found Friday after apparently being brought to the border by human smugglers who remained in Mexico. SALT LAKE CITY (AP) — Search and rescue crews are combing the desert for a teenager who ran away from a youth treatment program in Utah. The Beaver County Sheriff's Office said Thursday that 13-year-old Roberto Madrigal, who is from California, had been in the Redcliff Ascent program for about a month when he disappeared. Authorities say he's believed to be carrying water, but dehydration remains a concern in the arid climate and remote southern Utah location near St. George. President Donald Trump is recognizing Mormon pioneers who journeyed across the west to build a new home in Utah. Trump said in a statement issued Tuesday by the White House that the families who fled persecution in Illinois "worked tirelessly to transform the arid desert landscape into a blossoming new home." LAS VEGAS (AP) — Federal law officers have seized more than 4,000 marijuana plants at a growing operation in Death Valley National Park thanks to a tip from hikers in the area along the California-Nevada line. Rangers for the National Park Service and Bureau of Land Management raided the site July 3 after the hikers encountered three men installing irrigation hose near a spring in the Mojave Desert's Hanaupah Canyon. RENO, Nev. (AP) — U.S. wildlife officials have agreed to consider Endangered Species Act protection for a rare toad in northern Nevada's high desert where one of the biggest producers of geothermal energy in the nation wants to build a power plant. LAS VEGAS (AP) — Environmental groups are speaking out against southern Nevada officials looking to get permission from Congress to open up land outside of Las Vegas for development. RIVERSIDE, Calif. (AP) — University of California, Riverside researchers are naming one of two fossils they discovered in an Australian desert after former President Barack Obama. Professor Mary Droser told The Press-Enterprise in a phone interview on Wednesday that the fossils belong to two never-discovered types of creatures that lived 540 to 580 million years ago. LAS CRUCES, N.M. (AP) — Scientists and geographers from New Mexico State University are helping to locate and record natural and cultural resources on the Organ Mountains-Desert Peaks National Monument. The university says the work is funded through a five-year grant from the Bureau of Land Management. The information will be used to better manage resources across the monument and to create a database accessible to the public. When you think of Australia, what animals come to mind? For most of us it will almost certainly be kangaroos and probably cute, cuddly koalas, which are actually marsupials and not bears. Maybe those who remember the late Steve Irwin will think of the saltwater crocodile and some may even list various snakes and spiders. The thing is though, there is another animal that's becoming common in the wilds of the Australian outback, one that you would probably never think of. That animal is the camel. TUNIS, Tunisia (AP) — The colors of Tunisia's landscape change hourly with the light of the Mediterranean sun. Vermilion, sapphire, olive green, white, gold and ocher can all be seen in the sky, sea and sand. MATMATA, Tunisia (AP) — There's a reason the original "Star Wars" movie was filmed here in the deserts of southern Tunisia. This stark, remote landscape looks like another planet. 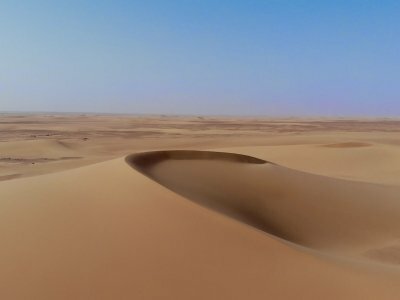 One of Tunisia's vast desert regions is even called Tataouine, like Luke Skywalker's home planet, Tattoine. One of the longest-recorded mammalian migrations on Earth has been discovered passing through Jackson Hole, northwest Wyoming and well beyond. A University of Wyoming-tracked research mule deer that winters in the Red Desert not far from I-80 hoofs it all the way to summering grounds near Island Park, Idaho, making a 242-mile trip. DEATH VALLEY NATIONAL PARK, Calif. (AP) — Federal officials say a rare desert wildflower that only grows in Death Valley National Park is no longer endangered. The U.S. Department of the Interior says the Eureka Valley evening primrose is no longer in need of protection. The large flower with white petals and green leaves can be spotted on the sandy desert floor of the Eureka Valley area on the California side of the enormous park. CASPER, Wyo. (AP) — The longest recorded migratory mule deer herd in the world travels about 150 miles (241 kilometers) from the Red Desert in southwest Wyoming to a place called the Hoback. Discovered in 2012, the route garnered national attention and inspired countless discussions about its protection. It was an example of something infinitely impressive: the longest mule deer migration trekking unnoticed in Wyoming's backyard. ST. GEORGE, Utah (AP) — Southern Utah officials who want to build a highway across a picturesque national reserve say a proposed land deal would stave off major road congestion in the fast-growing area, but environmentalists worry it would hurt the threatened Mojave desert tortoise and other sensitive species. There’s little reason to doubt the accuracy of predictions for a horrific fire season in Arizona this year. Though tinder-dry forests deservedly get most of the fire attention, fire prevention efforts in the desert areas can provide extra benefits. LAS VEGAS (AP) — It's not quite Noah's Ark, but Springs Preserve in Las Vegas is gradually becoming an urban lifeboat for some of the Mojave Desert's most threatened species. Before the end of the year, the Las Vegas Valley Water District-owned attraction will be home to three types of protected animals and a plant considered critically endangered in Nevada. PHOENIX (AP) — When I moved to Phoenix last summer, I was bewildered by all the bright green grass I saw smack in the middle of the Sonoran Desert — in residential yards, on golf courses, at community parks. While the temperatures were hitting nearly 120 degrees, these perfect lawns sucked up huge amounts of water delivered by the shussssh-chik-chik-chik of sprinklers before the brutal orange sun rose each summer morning. The Interior Department gave final approval 17 months ago to a massive planning document that, among other things, designated nearly 400,000 acres of desert in Southern California for wind, solar and geothermal energy production. The plan capped eight years of work, nearly a dozen public meetings and consultations with a wide range of stakeholders to determine which parts of 10.8 million acres of federal land should be preserved for conservation, which for recreation, and which for development.